Super Bowl Sunday in Arizona!! Yes, it’s finally here–Super Bowl Sunday! And all the hype you are seeing on TV (as well as the football game itself) is taking place right in the area of Arizona where we are spending the winter. Steve, Joy, Paul, and the three kids have all gone to the NFL Experience in downtown Phoenix. It’s after eleven a.m. Arizona time–one p.m. Eastern time–and I’m still in my PJ’s. Life is good. Paul tried for weeks to get tickets to the game but wasn’t able to. Turns out it’s a good thing as many people have flown here from Seattle and Boston only to find out that their tickets don’t really exist. Complex process of how the brokers sold tickets they didn’t possess–sort of like how short sales on the stock market happen is how I understand it. And the unfortunate thing is the weather has not even made up for their misfortune. We’ve had rain and cool temps–I don’t recall ever wearing my raincoat here in Chandler. Until this week, that is. Once they return later this afternoon we’ll have our own Super Bowl party: shrimp cocktail, bean dip, dates stuffed with garlic cloves then wrapped in bacon and broiled (thank you, sister Andrea, for the recipe! ), pigs in a blanket (just for you, son-in-law Chris!) and fresh-squeezed lemonade for the kids, Lemon Drops for the adults. 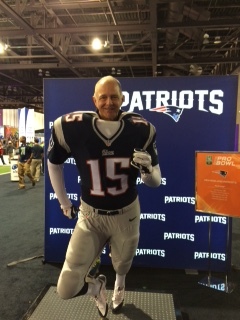 I’ve set my picks for the NFL Challenge–of course I’m rooting for the New England Patriots! On my Kindle I always read right to the Copyright page and in this case I am especially glad that I did. I discovered that Kline has written another novel, “The Way Life Should Be,” that takes place in this same fictional town. I am anxious to read it to find out how she connects the two novels as my three “almost” novels also take place in the same fictional town and I’m trying to figure out how to make that work. The sun is finally shining, the fog has lifted, and blue sky is peaking through the clouds. The real Arizona is starting to reappear. 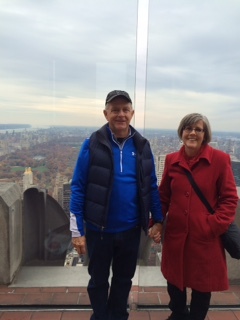 It is expected to be in the low 80’s and 100% sunshine starting the end of next week and lasting for the entire time our best friends, Gary and Maggie, are here from cold and snowy NH. Glad we could pull that one off!! It isn’t even midnight and I have submitted my novel, “It Takes A Village Store” to NaNoWriMo. All 50,060 words and a surprise ending–even to me!! And they have declared that I am a winner!! 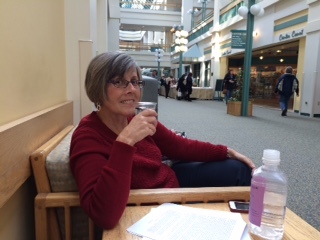 Yesterday was my CT scan at DHMC marking my two-year anniversary from surgery for adrenal cortical cancer (ACC). It was clear–NO EVIDENCE OF DISEASE! Exactly what I had hoped for and expected but, hey, you never know. The cancer can return at any time. The visit would have been uneventful except for my allergic reaction to the contrast material injected during the CT scan. At the end of the scan, the radiology technician noticed that I was rubbing my lips and, when I admitted I was experiencing an itchy mouth and swollen lips, I was suddenly surrounded by several other medical professionals and whisked off to recovery. I immediately was given a Benadryl pill followed by an IV of prednisone. After over an hour in the recovery room, I was released to a scrumptious turkey dinner in the hospital cafeteria–the reason I like my appointments scheduled on Thursday! My niece, Sammie, is celebrating her birthday today as well. In my family, we have multiple overlapping birthdays. The 50,000 word goal for NaNoWriMo is getting more and more elusive. I made it to 15,000 words after my 3,500 word marathon on Tuesday. With 35,000 words and only ten days left, including today, I will need to pump out another 3,500 words each day. Unfortunately, Thanksgiving falls in that time period, which we will be spending in Connecticut. I’d like to know who thought November was the right time for this awesome event? Wouldn’t January, with cold, snow, and thirty-one days have been a better choice? The good news is that no matter how many more words I am able to add during November, I have a good start on what I think may become a trilogy set in the town of Woodbury. It’s always good to have goals….. I scanned the December issue of the Better Homes and Gardens magazine this morning. Big mistake. All of the holiday decorating, cooking, and entertaining in that one issue made me feel totally inadequate. Unless you want a reason to be depressed–don’t waste your time looking at any of the holiday magazines. Whatever you usually do for the holidays, I suggest you cut back and carve out more time for simple celebrations with your family. Less stress–more memories. And who doesn’t want that? It’s been a hectic–but fantastic–week! The agony of turning 60 was diminished by the almost weeklong celebration with my friends and family. I feel so loved!! The day of my birthday, a group of friends/former colleagues from Wells River Savings Bank hosted a turkey luncheon for me. Thank you to Katie for opening your home to us!! Thank you to Barb, Gail, Gayle, Judy, Katie, Midge, and Winifred for their culinary expertise and for giving up part of their holiday to spend it with me (and for including my mother)! We missed you, Kim! 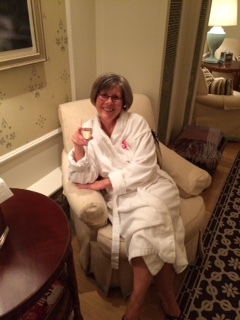 And Barb, it’s OK that you spilled the beans about my husband’s birthday surprise–a trip to the spa at the Omni Mount Washington Hotel. I highly recommend the amazing hot stone massage. And the facial took years off my face, at least temporarily. We ended the evening with a yummy dinner at Stickney’s restaurant at the hotel. At Thursday night’s writing group we discussed starting a group blog. Can’t wait to see how we do–I have a hard enough time keeping up with my own. But that one would involve a commitment, a deadline, and I respond well to those. Saturday morning we celebrated Steve’s mother’s 87th birthday with his family at Grafton County Nursing Home. Although Nanny has Alzheimer’s and is barely able to talk, she entertained us with her wide range of expressions. We were impressed when she fed herself a spoon of ice cream. Enough said…..
After the celebration we traveled to Farmington, CT, to stay with Joy and family. Jesse, Elise, and Sheffield arrived that evening. In honor of my birthday, they had made me a Jello poke cake (the same cake I made for Steve’s mother that morning)! It’s a Whalen family tradition–tasty and easy. Sunday morning we were all up early to board the train in Stamford for our day in New York City. First stop was ToysRUs where we rode the ferris wheel and checked out the toys, naturally. 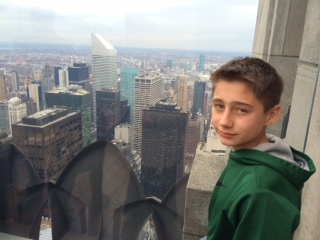 Next we walked to Radio City Music Hall for the Rockettes Christmas show. WOW!! At the Top of the Rock the adults delighted in the view of the city while the kids enjoyed the room with lights. We headed home Monday morning in the pouring rain, concerned that we would hit snow or, even worse, freezing rain but we didn’t. Yankee Candle in South Deerfield, MA, was the last stop of our trip. Sheffield and Elise particularly enjoyed the Christmas section. And so did I! I was dismayed to not be able to work on my NaNoWriMo novel in the car due to a dead laptop battery. Nor did I have the notebook I always carry with me. Steve dropped me off at my final memoir writing class. I don’t think I’ll write a memoir about my own life but I would like to write one of my mother’s. Guess I better get going on it. I highly recommend the novel “Little Island” by Katharine Britton, our instructor. At this last class she provided information about getting published. Good thing I am writing because I want to and not because I hope to get published!! I am spending the few days until our return trip to CT for Thanksgiving trying to catch up on my NaNoWriMo (and my rest!!). I’m so far behind that it will take a major commitment on my part to hit my 50,000 words. Actually, it is going to take a miracle. I believe–do you? Say it isn’t so–60 years old??? 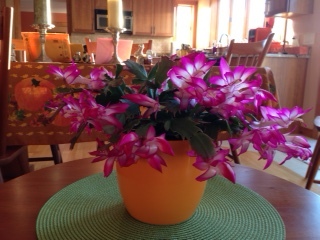 This is one confused–and gorgeous–Christmas cactus! Apparently it thought it was more important to blossom for my 60th birthday than to wait for the holidays. I am thankful for it’s thoughtfulness! It also may be happy to finally be out of the green plastic pot it arrived in when I was recuperating from my surgery two years ago this month. I am thankful for all the love and support that has been showered on me these past two years and this cactus must know it. Today the temps are supposed to be in the high 50’s–maybe we’ll hit 60 in honor of my birthday! Then the cold weather arrives (Siberian Express?? 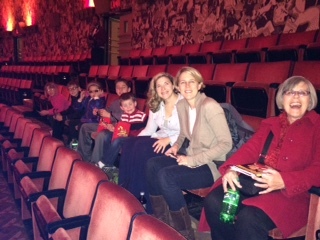 )….just in time for our trip to NYC to see the Rockettes on Sunday with Joy and kids and Jesse and kids. Sad that Jen, Jeff and their girls can’t make it from Virginia but they (without Jeff) will be at Joy’s for Thanksgiving–awesome! Except Jesse and family won’t be there for the holiday…. About fifty years ago today I had a letter to the editor published in the Bangor, Maine newspaper about honoring our veterans on Veterans Day. The beginning of my writing career! At the time, my father was stationed at Dow Air Force Base (now closed) and it seemed important for me to focus on something other than my birthday. It still is. So Happy Veterans Day to all the veterans in my family–my father, Steve’s father, my sister, Bessie, Steve’s brother, Mike, and all our relatives who have served and are now gone. And thank you to all those family and friends who are currently serving our country, including Eric Reid and Ben Roy. A novel in 30 days! 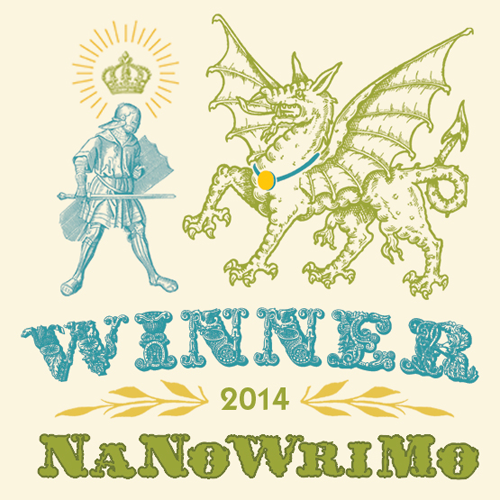 Today is the start of NaNoWriMo (National Novel Writing Month) and I just completed my first 1,667 of 50,000 words! I did not even know until yesterday what I was going to write about and that only developed by picking Steve’s brain on one of our gas-wasting late afternoon rides. I am cheating because I am using a character out of my very first novel, “Anne,” and naturally that means I’m using the same setting. It picks up where “Anne” left off with a different protagonist. And that’s about as far as I’ve gotten. I do have a title: “It Takes A Village Store.” (I hope Hillary likes it.) It was Steve’s idea to base it on the village store. I believe in giving credit where credit is due….. This past Monday I started a four-week memoir writing class in Lebanon offered by the Women’s Resource Center at DHMC. It’s tricky juggling three writing projects (NaNoWriMo, memoir writing, and my writing group) but I can only produce with deadlines and commitments so this is a good thing! And I gain one whole hour tonight because we set the clocks back–and I’m using it to write this long overdue blog post. those we hit in one day on a trip down to the Lake Sunapee region. Even with directions off the State of NH web site, we had a difficult time locating a number of them, somehow driving by them a few times before seeing them right in front of our eyes. I’m proud to say we got through the day with nary an argument (easy to say weeks after our adventure!). Doubt if we’ll get through the remaining 222 before we leave for Arizona but it’s nice to have goals, isn’t it? 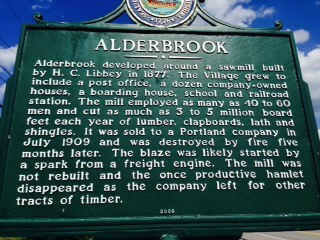 Alderbrook is the first one I took a photo of–I was alone on my way back from a DAR meeting in Whitefield. Interestingly, neither Hanover nor Lebanon have any historic markers…. This afternoon we saw “The Judge” at the Nugget Theater in Hanover. Steve and I both enjoyed it, which doesn’t always happen when there are tears involved. If you haven’t seen it, do, despite the 2 1/2 stars it received!